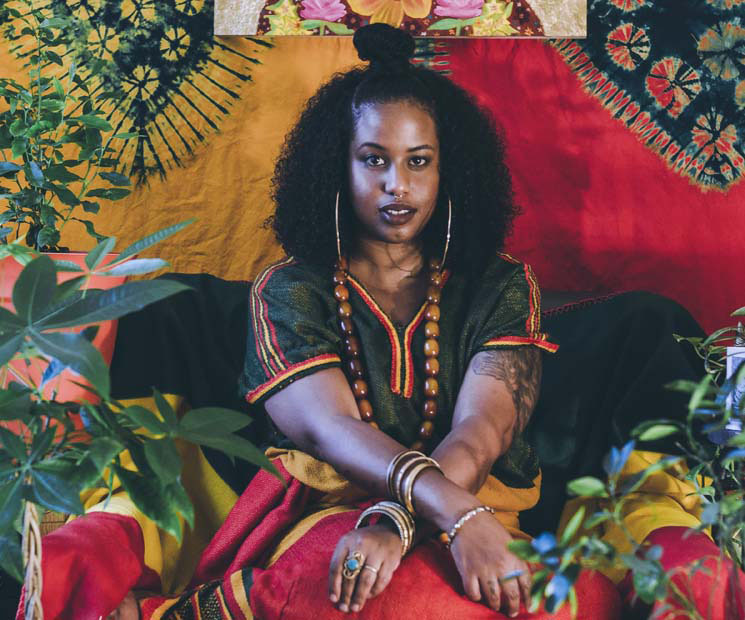 "I want to be able to change people's mind and perception of what a black girl can sing about or be about on stage"
The music Ayo Leilani makes as Witch Prophet hovers above R&B and hip-hop descriptors, but doesn't land on either. On The Golden Octave, the debut album from the self-described witch, prophet and healer, Leilani plays with funk, house, pop and folk sounds. Her layered vocals are always moving, challenging your assumptions of where she will go next. "I'm definitely always pigeonholed into the R&B/hip-hop zone, which is fine, because I get why people think that," Leilani tells Exclaim! "It's the easiest thing to do. It's a black girl singing on beats. That's why, with [The Golden Octave], I chose a bunch of beats that maybe people wouldn't expect me to. I want to be able to change people's mind and perception of what a black girl can sing about or be about on stage." The Golden Octave — a title Leilani says refers to "a level of sound that penetrates deep into your soul" — has been ten years in the making. "Manifest," the album's first single, released last fall, was written a decade ago, while other songs were written as recently as last September. Over this time period, Leilani struggled with finding the confidence to record and release her music. "It's really a process of digging deep and connecting with myself and connecting with the songs." She found confidence through self work and from the support of DJ, producer, and partner Francesca Nocera (aka Sun Sun). "I am very grateful for her," says Leilani. "We recorded the whole album in our living room, and I felt comfortable because it wasn't out in front of other people to judge. It was in a safe space." Much of The Golden Octave is about finding that safe space. On "Reprogram," Leilani counsels you to "take control," while songs like the glitchy "Weight of the World" and "Listen," which features the Cliks' Lucas Silveira, are about struggling with a mental illness, but manage to invoke hope. "I say I'm a healer because my music is a way for me to heal," Leilani says. "I also hope that people listen to it and find messages for themselves, and it helps them to heal in any way." The record also touches on Leilani's spiritual journey from her religious upbringing to her ongoing interest in the occult and her thoughts on the soul's journey. On "Time Traveler," which features Lido Pimienta, Leilani considers one of her past lives: "I'm a time traveler from another dimension," she sings. "I always think that time is not linear and that there's no past, present or future. It's all happening at the same time," Leilani explains. "In essence, the person Witch Prophet is a reincarnation of who I believe one of my past lives were: a woman, Russian occultist from the 1800s. The song 'Time Traveler' is about me finding out who I was in a past life and then telling people in this life. What would they do if I told them who I was? This occultist witch from the 1800s who was also a witch in 2018 who might also be some sort of magical person in [the year] 3000, all at the same time. "This sounds super hokey and I don't know if a lot of people will get it, but I really believe in that stuff and I don't necessary [not] believe in other things as well. I don't believe in limiting myself to one exact thing. And how cool would it be if that actually was a thing? A lot of people don't think about existential questions, it freaks a lot of people out. I love thinking about those things and trying to tap into the magic of this Earth or whatever it is we're living on, and I use music to do it. I've tried to write party tracks but it really doesn't work, so I write what I'm thinking about." But maybe The Golden Octave is a record for those parties where people have involved conversations about death. "Yeah," Leilani says laughing. "The tracks still bump, they just make you think!" The Golden Octave comes out on May 18 via 88 Days of Fortune.